WinSpeedUp is an application that lets you tune and optimize Windows 98/2000/Me/2003/XP and Windows Vista to suit your computing environment and needs. With access to Windows' hidden system options, programs can start faster, unnecessary files can be deleted from your hard drive, Internet and LAN connections will be faster, the sytem start can be accelerated, and your system will be more stable. Windows is much too complicated to be a "one size fits all" solution to computing needs. WinSpeedUp makes it easy to tune Windows to support the way you use your computer. To use all functions of the free, functionally limited shareware version you need an unlock code. You can order an unlock code for $19.95. If you have an older version of WinSpeedUp installed, you can use the integrated wizard to automatically update to the latest version Alternatively, you can uninstall WinSpeedUp, download the latest version and install it. For registered users: the unlock code will be saved and will work with all future versions, even if they cost more than you had paid originally. 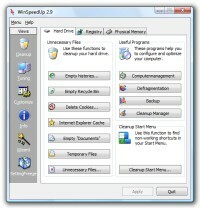 Since WinSpeedUp version 2.8 we no longer support Windows 95. If you are still using Windows 95 you can download and install WinSpeedUp version 2.7. This is the last WinSpeedUp version with support for Windows 95.